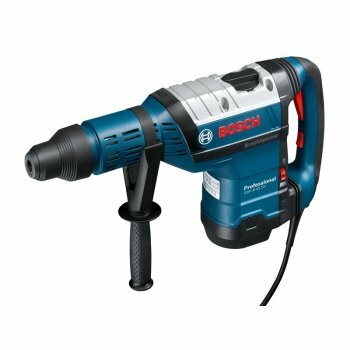 Bosch GBH 8-45 DV 8kg SDS-Max Hammer is equipped with anti vibration technology, it has a low vibration of only 7 m/s² when chiselling and 8 m/s² when drilling due to intelligent triple vibration damping system. It has a performance when drilling and chiselling thanks to the powerful 1,500 Watt motor and 12.5 Joules of single impact energy. 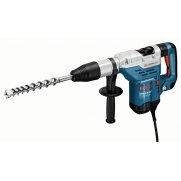 The turbo power function provides additional performance in chiselling mode due to additional use of the energy used for rotation in drilling mode. 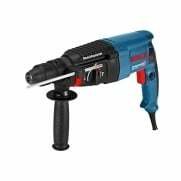 It is made from robust metal components and has a unique automatic switch lock for the best convenience in continuous chiselling applications. Other features include: an overload clutch to protect the user and the machine, soft start for clean drilling starts and a speed controller for optimum adjustment to suit the application. 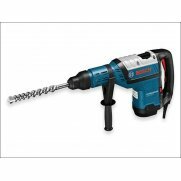 Specification Input Power: 1,500 Watt.No Load Speed: 0-305/min.Impact Rate: 1,380–2,760/bpm.Impact Energy: 12.5 Joules.Toolholder: SDS-max.Drilling Diameter in Concrete: Hammer Drill Bits: 12–45mm, Breakthrough Drill Bits: 80mm, Core Cutters: 125mm.Optimum Range: Concrete (Hammer Drill Bits): 20-40mm.Weight: 8.9kg. Noise/Vibration Information Measured values determined according to EN 60745. Total vibration values (vector sum of three directions). Chiselling Vibration Emission Value ah: 7.0 m/s².Uncertainty K: 1.5 m/s². 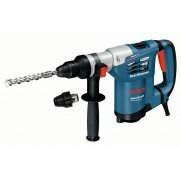 Hammer Drilling in Concrete Vibration Emission Value ah: 8.0 m/s².Uncertainty K: 1.5 m/s².